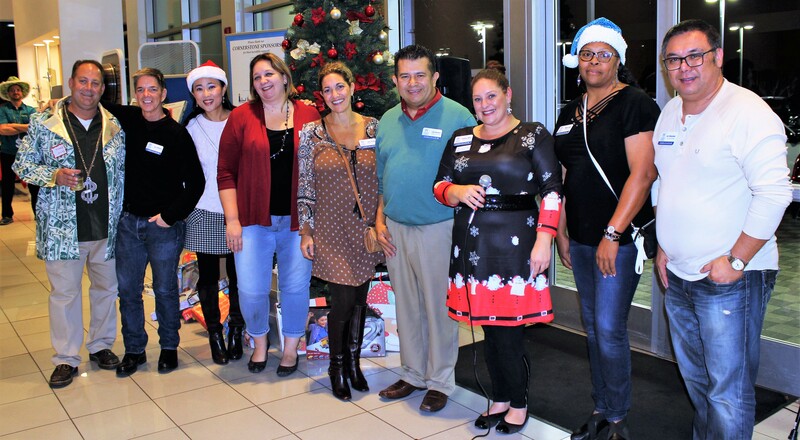 The Ambassadors are a dedicated group of Vallejo Chamber of Commerce members who volunteer their time to foster and promote the goals of the Chamber to our membership and the community. Ambassador members act as volunteer liaisons between new and prospective members and the Chamber Board of Directors and staff. The mission of the Ambassadors is to effectively promote membership to the Chamber to new and prospective members, while encouraging current members to maximize their membership. Ambassadors achieve this mission through attending Chamber events, Ambassadors meetings, and maintaining awareness about Chamber events and programs to share with other members. Ambassadors welcome new Chamber members, regularly visit and call current Chamber members, assist members with networking opportunities and generally act as the welcoming committee for the Vallejo Chamber of Commerce. Ambassador members host ribbon cuttings, grand openings, and volunteer at business mixers and at major Chamber and community events. Through periodic visits and phone calls to new and existing members, Ambassadors gain a better understanding of members' business needs and assist the Chamber in developing services to meet those needs. The Ambassadors Committee meets the first Wednesday of the month at the Chamber from 5:30 to 6:30 p.m. The meetings include Chamber updates and news, as well as the benefit of Chamber programs and networking opportunities. Would you like to be part of the team? Do you see yourself as an energetic, dynamic, community-oriented person? Contact Chief Ambassador Toni Condit (ToniCTFA@gmail.com) for more information. Toni Condit was born and raised in Hayward, California, and moved to Vallejo, California with her husband Todd more than 2 years ago and has fallen in love with the city and all the people. Toni has an older brother and two younger sisters. In 2017, Toni Condit became a new member and Ambassador to the Vallejo Chamber of Commerce. She is also part of the downtown Merchant’s Committee. Toni is an avid runner who has completed Brazen trail runs and Rock n Roll half and full marathons. She has three cats and has a love for animals, she enjoys volunteering in various charities for Cancer and Alzheimer’s Awareness, Persons with Disabilities and Kid’s for Education events just to name a few. She has a passion and love for gardening and enjoys spending time tending to the vegetables for relaxation. Toni spent 20 years in the medical field as a medical biller with several certificates, before discovering her true passion for helping families. She works with individuals and families providing the proper education to become financially secure, protecting their income and assets from loss and achieving financial freedom. She holds a license and has received several awards for outstanding achievements. She works with others developing leadership skills to become team leaders as part of World Financial Group-A Transamerica company, whose mission is “no family left behind”. Billy Charles was born and raised in Sacramento California. In 2006 began working at Six Flags Marine World, moved to Vallejo in 2007 and still works for Six Flags Discovery Kingdom today as Facilities Manager. Billy received his B.S. degree in Business Administration from Cal State East Bay specializing in Corporate Management and Marketing Management. Billy is an Alumni of Leadership Vallejo, graduating with the Year 10 class in 2017 and was recipient of the prestigious Chameleon Award. Billy is also a part of the Leadership Vallejo Curriculum committee. Prior to moving to Vallejo Billy went through the Culinary program at American River College in Sacramento where he developed his passion for cooking. Billy is married, has two sons and a daughter who all enjoy traveling, sports, movies, cooking, and spending time with family. Tina Fowler was born in Vallejo, and has lived here continuously ever since. In 2007, she and her husband became the third generation owners of Newcomb & Sons Locksmith, which has been a Chamber member for over 50 years. She has sat on several boards, including Leadership Vallejo, Vallejo Police Activities League, the Cystic Fibrosis Foundation Northern Chapter, the UCSF Children's Hospital Family Advisory Council and Boys Scouts of America. Tina is also a past employee of PG&E and the City of Vallejo. She currently works with the Vallejo Chamber as the membership specialist, working to make sure that the Chamber members are known to each other! Tina has been married to her best friend for 24 years, and has a 22 year old son Justin. In her off time, Tina works diligently highlighting the positive aspects of Vallejo's community to ANYONE who will listen! Dennis Kittelson has been a resident of Vallejo for nearly 2 decades, supporting, contributing to and participating in the rehabilitation, development and direction of arts, entertainment and quality of life for residents and visitors of the City of Vallejo and Solano County. A local small business owner, Dennis Kittelson is an active volunteer and board member of the Executive Lions of Vallejo and a member and Ambassador of the Vallejo Chamber of Commerce as well as an alumni of Leadership Vallejo, a Chamber sponsored program. With a certificate in paralegal studies from Napa Valley Community College and over 20 years experience, Dennis founded his company Legal Mind Attorney Service in 2007, providing paralegal support to the public, legal community and courts of the greater San Francisco Bay Area and throughout California. In 2016 subscribers of the Times-Herald voted Legal Mind Attorney Service Best Notary Public of Solano County. Dennis Kittelson is proud to have been invited to join and serve the Vallejo Community Arts Foundation as a new member of the board and looks forward to the continued success and growth of VCAF’s programming and patronage. Jennifer was born and raised in Pleasant Hill, CA, and moved to Fairfield CA with her husband and three children. After graduating from high school, I continued my education at Silicon Valley College. Working at Target as a switchboard operator in the evenings after school. In 2003, I relocated to Fairfield, CA and continued to work at Target. In 2005, I went to work at Pinnacle Builders as a receptionist for a period of two years. I continued my employment with Express Personnel performing duties such as interviewing potential candidates for our vacancies, made service calls to potential clients and took all incoming calls. In July of 2010 I took a position at the Northern Solano Association of REALTORS® as the Membership Coordinator. I was responsible for assisting new member REALTORS® with orientation, explained all the benefits of being a member of the association and annual billing for all membership dues. In 2015 I relocated to the Solano Association of REALTORS® in Vallejo as administrative assistant. My responsibilities included, but not limited to, servicing agents with local Multiple Listing Service, create and send out a weekly newsletter, assist several committees with flyers and posters for local events, which I attended, signed new REALTOR® members into the association. April 2018 brought a new challenge to me. I was promoted to the Office Manager. My new responsibilities include assisting the office staff with questions, billing for the membership dues and Accounts Payable practices. Assist committees and special events within the Association, and set the Broker Tour for the marketing meetings. Kevin Rahill is a Mortgage Advisor with Pinnacle Capital Mortgage. Born and raised in Vallejo, he has been lending to homeowners in the Vallejo area since 1992. Specializing in the home purchase market and working with first time homebuyers, he has assisted hundreds of clients achieve the American Dream of owning their first home, while training dozens of new Realtors on the basics of home financing. Active in the Solano Association of Realtors since 1992, Kevin was awarded the Affiliate Member of the Year in 2006, was the Chairman and active member of the Real Estate Finance Committee, and was also active in the Technology, Special Events, Program, and Scholarship Committees with the SAOR. He is currently working to bring back a program that teaches a Basic Financing and Credit course to high school seniors in Vallejo and Benicia public and private schools. Kevin has been a member of the Rotary Club of Vallejo since 2004 and was awarded as the club's Rotarian of the Year in 2016. He has served on the Board of Directors for over a decade, and also served as Club Treasurer from 2009 to 2014, and he is currently the club's Sergeant at Arms. Since 2004, Kevin has been the Director of Rotary's Literacy Project, which provides a full size Dictionary to every third grade student in Vallejo. He has also been active since the inception of Rotary's Fishing in the City program, teaching hundreds of local children how to cast a fishing rod during the program's training session each year. Kevin is also a graduate of the Leadership Vallejo program's Year 2 class in 2009. Kevin attended Pennycook Elementary and Springstowne Junior High, and graduated from Hogan High School. He received a Bachelor's Degree in Business Administration from San Diego State University in 1990. While at SDSU, Kevin was the starting placekicker for the 1986 Aztec football team and played in the 1986 Holiday Bowl. He was also a member of the 1987 Aztec soccer team. In 1989, Kevin was the College of Business's Representative to the SDSU Associated Student Council. He was an active member of Sigma Nu Fraternity and Beta Alpha Psi Honor Society. Kevin has lived in his home near the Masonic Temple in Vallejo since 1996. His parents, Bob & Judy, live nearby and visit with him often. He is excited to contribute more to the city he loves through this new channel as a Chamber of Commerce Ambassador. Maggie received her degree in Business Administration majoring in Accounting & Finance from the University of Hong Kong. She was certified as a SAP (SD) solution consultant in 2008. In her early days of career, she developed a special interest while solving problems that no one ever want to take care. She feel great for helping people and helping business. After that Maggie became an engineer. She started to write software applications and design UI since 2012. Some major accomplished projects include: CRM and Broadcasting system for a MountainVeiw radio station, Warehouse management system for a South San Francisco book distributor, Contract Management system and School admin system…etc. Maggie was born in Shanghai and grew up in Hong Kong. She speak Cantonese and Mandarin fluently, as well as Shanghainese with her family. She settled down in Vallejo since 2015, after spending 4 years moving around San Francisco east and west, Pacifica and Daly City. Prior to moving to US, Maggie spent 7 years in the Oil industry as a regional SAP Manager working in the largest French oil company in Hong Kong. Amy was born and raised in New York. She worked many years in the retail merchandising industry where she met her husband. They moved to New Jersey and Amy raised her 3 children along with running a house cleaning business and a team of ladies in a direct marketing business. Most of the focus in Amy's community efforts was geared toward special needs children. The opportunity came to Amy and her husband to move to California and run and own their own Grocery Outlet store in Vallejo. They packed up their family, sold their house and made Vallejo their destination. Amy is always looking for ways to be a part of the community here in Vallejo and continues to focus on doing all she can to support the people and business here.